When Gary Yamamoto designed the Senko in the early 90's, he had no idea he was changing the future of fishing. Now it seems that every company has a similiar "do nothing" copy of GYCB's creation, but none have figured out how to make one quite as effective as the original. Over the ensuing period of time, the original senko, has been bolstered with two-tone and laminate models. There's a senko in the lineup for every possible application and for every angler, from the first-timer to the tour-level pro. 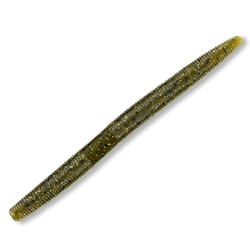 Whether you fish it weightless, wacky-style, Texas-rigged, on a Carolina Rig, or on a shakey head or flipping jig, this simple slab of plastic will revolutionize your game and increase your catches.